A different route home took me past this barn one spring evening. It was dusk, past sunset, the blue evening sky visible through the barn where walls once were, exposing the ‘bones’ of this barn. It’s beauty took my breath away. In the early hours of daylight the next morning I was back at this barn, gravitational forces at work. At first, I tried to maintain a self-imposed ‘no trespassing’ boundary, but the more I fed my camera, the more photos I had to take. I ventured to the side, and eventually around to the rear of the structure, capturing the changing light as it filtered thru the open slats. My feet, shoes and jeans soaked by the early morning dew on knee-high grass. Birds flew past, oblivious to my presence. Weeds grew among remnants of machinery left behind, rusting in the sunrise of the new day. I imagined this farm in better days, before its retirement, filled with purpose and energy, unending labor. Its place in history. Textures, colors, gravity…I couldn’t pull away. I drove past last evening, a pile of rubble remained. I imagine the artist who will create a new purpose. What timing! 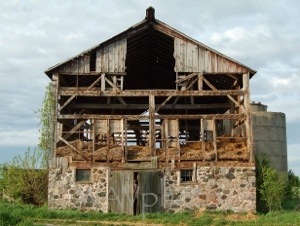 You captured that old barn’s beauty, in its last breath. Now it will be reborn , as you say, in the hands of the it’s next creator. It brings to mind the parallels of humanity and our journey. The signs of aging should be cherished, sags, wrinkles and creaking bones. A busy and useful life , until we are recreated and born into eternity as I believe our creator will make us anew. I feel the same-that my timing worked out. I may have photos of the same barn from my first winter here (I have a thing for barn photos! ).